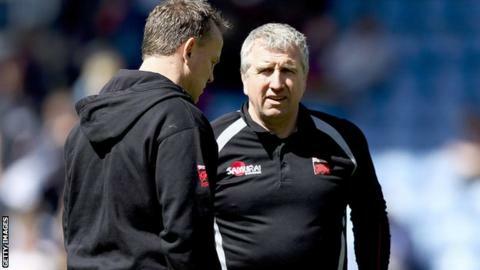 Speculation about the future of Newport Gwent Dragons director of rugby Lyn Jones is inevitable because of poor results, says former lock Ian Gough. Jones was seen at Harlequins training, raising doubts about his position. Although his absence from the European Challenge Cup win at Gloucester was put down to illness, Gough thinks Jones could be under pressure. "Things have not gone well for Lyn at the Dragons this year," he told BBC Radio Wales Sport. "The mystery seems to be going on longer now, it actually adds more speculation to it. "It's been very worrying and when the results have gone the way they have, questions start to get asked and people start lighting embers under the fire. "For him to not be there at the game when they actually pull out a fantastic win away from home, it adds to the speculation as well." Dragons head coach Kingsley Jones dismissed speculation about Lyn Jones as "tittle tattle." "It's ridiculous and I just tend to switch off from it," he said. Dragons are the lowest-placed Welsh side in the Pro12, lying in 10th spot and 18 points behind Ospreys in ninth. Former Wales lock Gough, who had two spells playing for the Dragons, thinks Jones must take responsibility for another disappointing domestic campaign. "If Lyn was honest and looked back, he hasn't got the results," he added. "He had two or three years to mould his side - he's brought signings in and this year it's been very poor. "Rodney Parade used to be a fortress and it's not quite happening under his reign. "So you can have the speculation but on the form and the results this year, although there have been some close results, it's not quite happened."